Batman vs. Two-Face debuts in homes this week — it had its premiere at New York Comic Con on Sunday morning — with William Shatner in tow as the titular villain. When I first saw the trailer for Batman vs. Two-Face, I was struck by how it seemed like the movie was a more straightforward take on Batman ’66 than the slapsticky Return of the Caped Crusaders. As it happens, that was the producers’ intent: Two-Face’s entry into the series led to a more ’40s, noirish mix. “We took our cues from the first season of the series, which was definitely straighter, a lot more darker scenes, like more nighttime scenes,” said supervising producer/co-writer James Tucker. “In a way it’s weird because the first movie, Return of the Caped Crusaders definitely was more like the second season and third season in tone. And with this one we wanted to go back to the more grounded first season, where the camp was there but it … walked a tighter line. 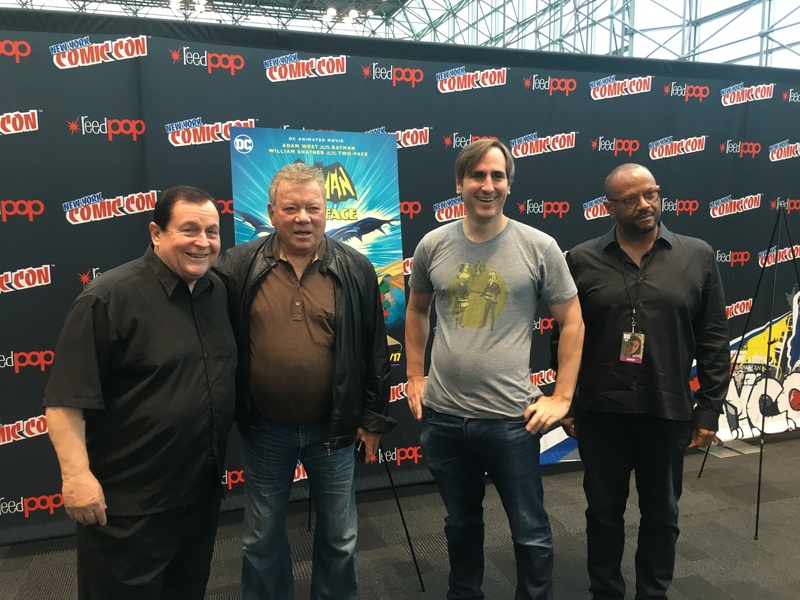 Burt Ward, William Shatner and co-writers Michael Jelenic and James Tucker. Batman vs. Two-Face is available for download 10/10 and will be available on disc 10/17. MORE: For William Shatner’s thoughts on Adam West and playing Two-Face, click here. This sounds great. I love the Batman 1966 series but have always thought Season 1 was the best.